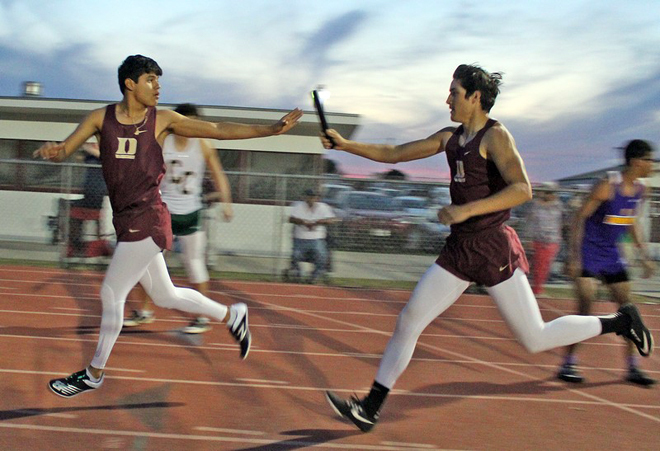 Warhorse Stadium is the site for Wednesday’s Area Track Meet that pits top four finishers from District 29-4A in each event against top four finishers from District 30-4A. Sixteen Arabians and 18 Warhorses qualified for the opportunity to advance to Regional on April 26-27 in Kingsville. 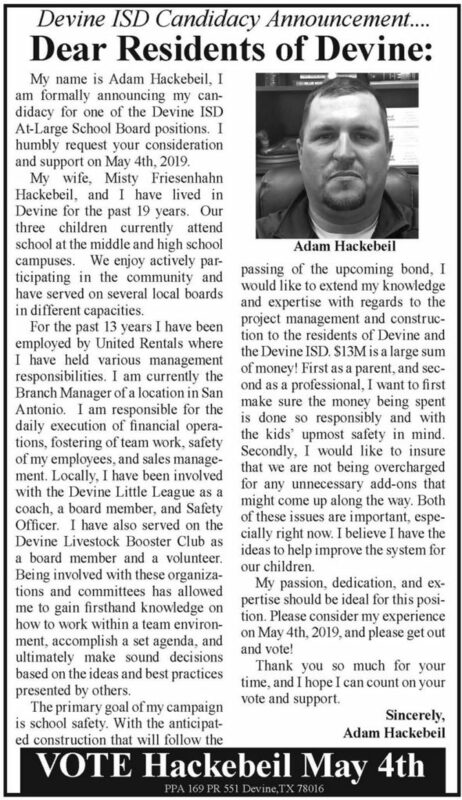 District 29-AAAA: Carrizo Springs, Crystal City, Devine, Hondo, and Pearsall. District 30-AAAA: Cuero, Gonzales, La Vernia, Navarro, Pleasanton, and Poteet. Warhorses/Events: Grant Collins (4x100m, 4x200m, 4x400m), Xsavior Martinez (4x100m, 4x200m, 4x400m), Brady Hackebeil (4x200m), Justin Contreras (Long Jump, Triple Jump), Tristan Ortiz (Shot Put), Tanner Hardcastle (Shot Put), Truett Barron (Shot Put), Dakota Wofford (Discus), Damian Martinez (Triple Jump, High Jump), Brady Cardenas (High Jump), Jacob Featherly (Pole Vault), Isaiah Oropeza (100m, 200m, 4x200m), Joey Seguin (Pole Vault), Donavon Camacho (400m, 4x100m, 4x400m), Jayce Hackebeil (400m, 4x400m), Xavier Garza (1600m), Guido Zapata (110m Hurdles, 300m Hurdles, 4x100m), and Christian Gerlach (110m Hurdles, 300m Hurdles). Alternates: Bobby Spicer (100m), Evan Priest (Discus), and Zachary Alvarez (Pole Vault). Arabians/Events: Aaliyah Terrazas (200m, 4x100m, 4x200m, Long Jump), Dana Aaron (4x100m, 4x200m, 4x400m), Andrea Gomez (4x200m, 4x400m), Mackenzie Schneider (4x200m, Triple Jump), Analea Brooks (Discus), Jessie Ramirez (Shot Put), Maycee Howard (Pole Vault), Brianna Bowyer (Pole Vault), Espi Mendoza (400m, 800m, 4x400m), Harlie Walker (400m, 4x400m, High Jump), Brooke Runyan (800m), Mari Murillo (3200m, 800m, 1600m), Megan Runyan (300m Hurdles), Kennedy Duncan (300m Hurdles), Alissa Stehle (4x100m, Triple Jump), Chasity Reyes (4x100m), and Jeanette Rios (4x100m). The 3200m Run was on Monday, April 15. Varsity girls: 1st-Clarissa Dominguez-Hondo-12:23.62, 2nd-Ivy Kohl-Navarro-12:25.53, 3rd-Veronica Moreno-Gonzales-12:33.13, 4th-Caitlyn Nieschwity-Pleasanton-12:39.02, 5th-Jaedyn Martinez-Navarro-12:51.56, 6th-Mari Murillo-Devine-12:59.62. Varsity boys: 1st-Angel Rodriguez-Hondo-10:19.28, 2nd-Bryce Carter-Navarro-10:20.31, 3rd-Devin Robles-Pearsall-10:23.37, 4th-Eduardo Serna-Crystal City-10:42.16, 5th-William Green-Cuero-10:520.72, 6th-Zaine Leal-Pearsall-10:52.02. 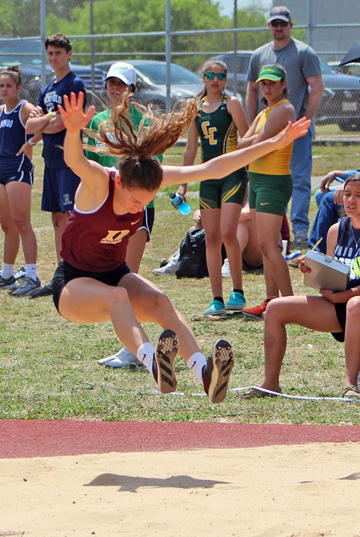 Arabian Alissa Stehle won Triple Jump at District and is competing in Area for a spot in Regionals.